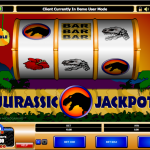 Jurassic Jackpot is a video slot game from Microgaming. The future of the world is in your hands, where you need to protect the humanity from these giant lizards. Hunt them down and earn some cash on the way. This is a classic retro video slot game that does not have any complicated features. The game play is very simple but enjoyable, thanks to the theme that is slightly different from what we are used to see in classic slots. In the background, behind the reels you can see mountains and palm trees during the golden hour. The graphics are very simple with purpose, so you can focus on the game itself. Jurassic Jackpot does not have only simple graphics but its game play is very simple too. Since this is a classic slot there are no overcomplicated symbols and features. 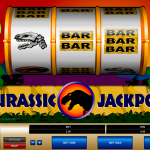 There is only wild symbol in Jurassic Jackpot and its main function is to substitute for all the other symbols. If you land a win with one wild in combination your win will be a subject to x 2 multiplier and if you have 2 wilds in the mix your win will be a subject to a x 4 multiplier. It is also worth mentioning that the winning combinations are not formed only with 3 identical symbols, but also there are a couple of mixed combinations that can bring some cash to your balance too. 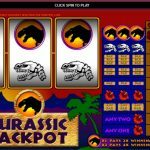 Jurassic Jackpot from Microgaming is a slot that is really unique, not only because of its unique theme but also of the atmosphere the game offers. A vintage video slot game that is still played and we believe that this says a lot about it. Another great example of a classic slot is Legacy a 3 reels slot by MicroGaming.